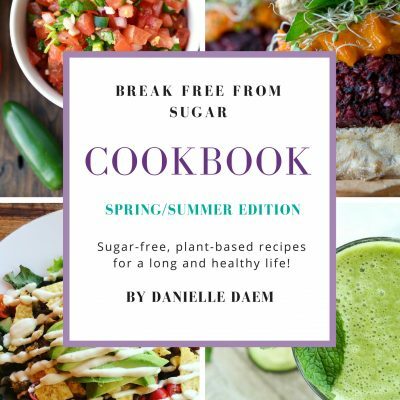 I’m so excited to pop in here today to share with you my newest sugar-free recipe creation! For the past few months I’ve been thinking about trying my hand at creating a healthy Pad Thai recipe and for some reason, being here in Hawaii inspired me to give it a try. I’m so thankful for my dear unexpecting friends who were the original guinea pigs for my first try at this recipe. A success from the get-go… this coming from one friend who has traveled to over 40 countries and is a huge food lover. If she says it’s amazing, it really is! A lot of Asian and Thai cooking calls for sugar in the sauces or white noodles too. This is why I knew I had to create something delicious without all that added “junk”. In a small skillet, heat 1 Tbsp of oil over medium heat. Rinse the chicken and add it into the pan. Season with salt and pepper. Cover, reduce heat to medium-low and cook chicken until juices run clear ~ 15-20 minutes. Spiralize the zucchini and add into a steaming basket. Steam noodles until al dante ~ 5-7 min. Set aside. In a medium saucepan, bring 4 cups of water to a boil. Add in the brown rice pad thai noodles and cook until al dante ~ 2 minutes. Strain and rinse under cold water. Set aside. Heat the remaining oil in a large high sided skillet over medium. Add in the red pepper, carrots, onion, and garlic. Saute until translucent ~ 5 minutes. Make the sauce by adding all ingredients to a high-speed blender. Blend on high until well combined and creamy. Set aside. Push veggies to one side of the pan and crack in the eggs. Cook through and then mix the egg in with the vegetable mixture. Once the chicken is cooked, remove meat from the bones and cut into small pieces. Toss in the bean sprouts, pad thai noodles, zucchini noodles, cooked chicken, and sauce into the vegetable mixture. Combine well and continue to heat over low for another few minutes then remove from heat. 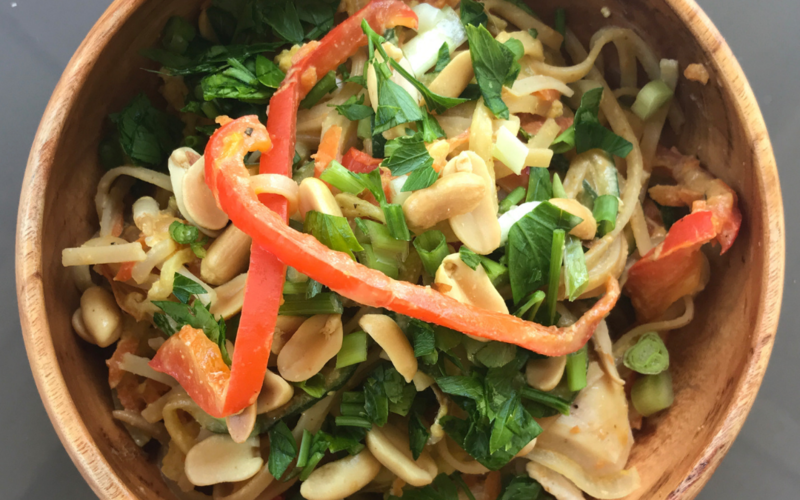 Dish out the pad thai into bowls and garnish with green onion, cilantro/parsley, and peanuts. Enjoy! It’s important to use UNSALTED peanut butter or else your pad thai may be too salty. This recipe is great for leftovers for up to 4 days. Serve warm or cold, it’s delicious both ways! P.S. Have you registered for the upcoming 7-Day Stress Less Challenge yet? We’re getting started on Nov 12th and diving into all things stress. If you struggle with stress and want to learn how to have a stress-free holiday season, come on over and register for free here!